The Elite Feed was launched June 2016 for current members of Trade With Joe. I have never advertised the ELITE FEED on the Trade With Joe website until now asI have kept is as an “add on” for Trade With Joe members. That has changed just now. The ELITE FEED is an “alerts only” feed where I call out all my weekly options trades. 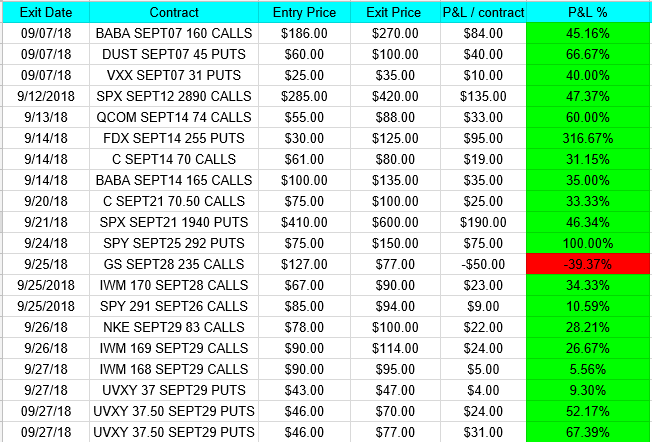 Here are the closed trades for September. All wins and all losses. Here is a sample of the trades you will see in the ELITE FEED. #1 – 3-5 trades per day using only weekly options. Most are weekly options that expire on Friday. #2 – REAL QUICK hold times. Hold times may last from 2-3 hours or 2-3 days. You are in and out of the market real fast. Rinse and repeat. You will get alerted to my exact entries and exits. I will also give #WATCH signals so you know ahead of time what I am watching. Intraday updates? Yes… You get them as well. It’s an alerts system for those that like to be in and out of the market real quick targeting 50%-100% gains per trade. There are two membership options and both are at a 67% discount. (The ELITE FEED is normally $97 a month. Rates will increase to $147 a month Nov 1st.) For current members I will never raise the rate as long as the membership remains active. Includes alerts on all above. #1 Trading Room Access. See my screen and hear my voice as I make trades. Share trading ideas with over 300 other traders. Get unusual options flow alerts through the day. #2 Access the PRIVATE FEED with longer term swing trades. #3 Live access to strategy sessions. #4 Live access to free webinars. As mentioned all rates will be going up November 1st. You can lock in these low rates before prices go up.